One of the most important buildings of its time, the IRT Powerhouse from 1904, showed what a modern, influential city New York had become. New York City had a subway system! The city leaders wanted to show this off by making a really flashy building to supply the electricity to the subway. 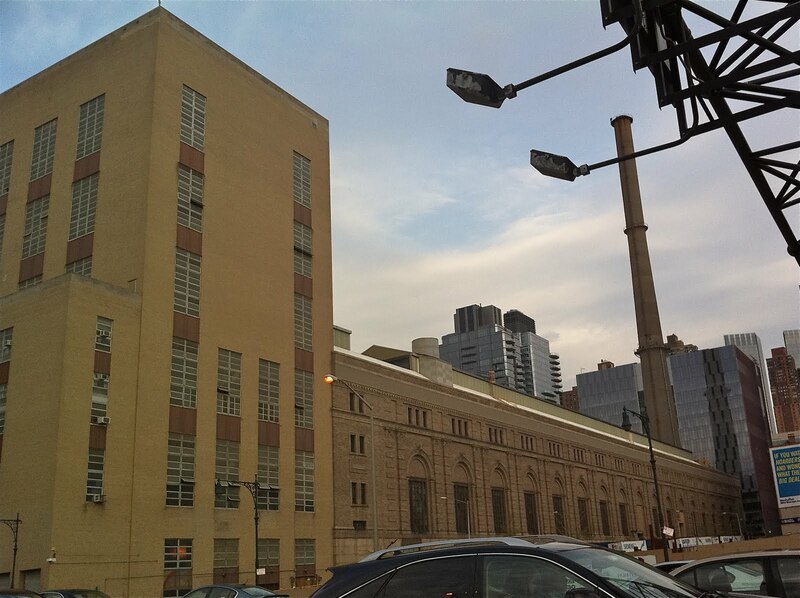 Like all important civic buildings built during this period, the Powerhouse was Beaux-Arts in style. But this building was designed by possibly the most well-known architects in the world, McKim, Mead and White. Before he was murdered by his underage girlfriend's husband, Stanford White designed the Powerhouse. The materials and details are stupendous, and the grandeur is reminiscent of the old Penn Station and the Post Office, also designed by McKim, Mead and White. The AIA Guide to NY Architecture called it "a brick and terracotta temple to power." 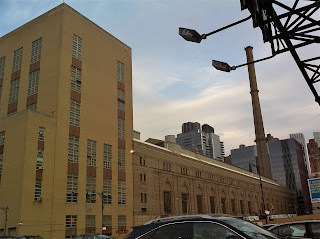 What caught my eye as I was driving down the West Side Highway the other day, was the western addition. This was built in 1952 and doesn't relate in style at all to the original building. Stanford White had actually designed an addition, but they chose not to use it. That might have been part of that whole mid-century idea of favoring a modern, less-fussy style or it might just have been cheaper. The colors harmonize with the old building and both buildings read as industrial at the time they were built, but both are so very much of their own time that's the only thing that really tells us today what this building was used for is the solitary smokestack. 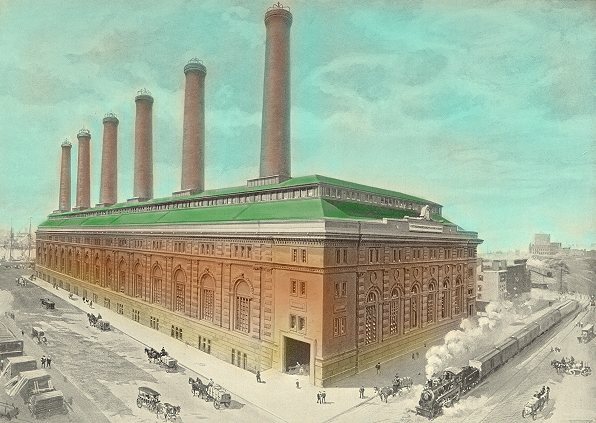 Originally there were six and they were meant to echo the smokestacks of the ocean liners that came to dock along the Hudson. Con Edison owns the building now and they were considering demolishing it to build condos. 59th Street along the riverfront is some of the most expensive real estate in the world. We drive by this building at least four times a week and we talk about its importance and now perilous existence. Click here for more info on the fight to save the Powerhouse!